Who makes the decision on which social media channel your brand or business should be on? Should you just jump on every new platform that comes your way? How does your agency (if you have one) help decide? Is your brand really relevant across all the channels you are on? 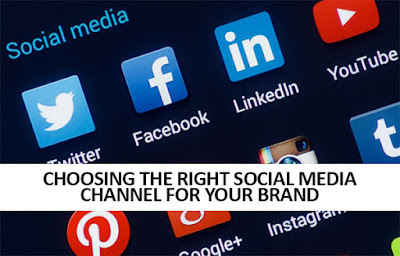 Deciding on a social media channel mix isn't complicated if you follow some basic guidelines. It's not just about resources, it is about how your brand aligns with each channel. It is about how your brand fits in to the ecosystem of the channel or platform, and then ensuring that your content resonates well within those parameters. There's no pint trying too hard. You cannot be everything for everybody. You'll need some kind of audience segmentation strategy in place. Look at each channel's profile. Who's on there? What do the current users look like? Does the user profile fit your brand's target audience profile? If your targets or your customers are not using that channel, that's a first starting point – don't bother. If users of that amazing new platform are teens and your brand deals in retirement homes, that's an obvious no starter, a no brainer. The other thing to look at is does the channel user profile aligns with the type of audience that will not only engage with your content, but also amplify it. Isn't that the basics of social? Start with user demographics for each channel that you want to be on, or are already on – and see if there's a fit. You'll need two things here – your target customer or current customer profile, and the channel user profile. These need to align closely. What kind of brands are on the channel? What does well? That's important. Are your competitors on the channel you want to jump on? What – from a content perspective does well? Are you a visually expressive brand – well, Instagram and Pinterest sound good. Are their great stories around your brand told in video? YouTube then. You need to see what kind of content is doing well on that particular platform already. Your brand should be able to produce and engage with the type of content that does well on that platform. You cannot suddenly create a whole new type of content for a new channel that just doesn't align with your "brand speak"(the way you express, and as well, what you express). Will your content resonate? Will it engage? Once you know who is on the channel, and what type of content does well on that specific channel, you'll need an honest assessment of whether your type of content really fits in. A lot of brands simply either use the same content across multiple channels they are on simply by tweaking creative formats, or try and lamely re-purpose them. That just doesn't work any more. Different channels have different audiences that will resonate to individualized, customized content that specifically speaks to them in the language of the platform – in ways they are used to. If you are unable to produce relevant, resonating content because there's just no fit, or you think you'll find adapting to that new platform difficult for your brands message – stop. And you need to make sure that by opening up your brand on yet another new channel, you aren't hoping to plug in boxes on a new column in your editorial calendar. That's lame. Do you have the resources? The time? The effort? Most brands today are already spread thin across the top social platforms. Adding on a new platform, a Snapchat for example – requires new thinking, new creative, fresh inputs, cool formats and most importantly a whole new sub set of content. Is your brand, or your social media agency, equipped to handle it? Social media is about engaging with the community and you'll need a good strategy to engage, a good execution team to create content, and a good community management team that can handle the dialog in a timely, responsive manner. You have that? It's hugely important to make sure that you are not jumping on without checking resources. And that you won't end up posting once a month or so, and waste the whole effort. And, remember, often a social media agency that works with your brand may not have the expertise required to support your brand on that new channel, or simply, may themselves be already spread too thin. Ask. Its important for you to know how social channels are performing – particularly in relevance to your brand vertical, your industry and your type of content. It's also important to be aware of what seems like up and coming, and trending towards a 'must-be-on'. Your audience may shift, their social habits may evolve with new trends, new interests, new platforms. You don't want to play catch up. In social media, catch up is a dangerous game.